Strange as it may seem, but the Revolution of 1848 in France, which established The Second Republic, to some extent had its negative effect on the national science advancement. The point is that the work trips of Russian scientists to Europe, not of frequent occurrence at the time, were practically stopped because one never knew which pernicious principles a person could get infected there. The condition of Russian science and education was in quite an unfortunate position in the fifties of the XIX century. Foreign reliable professors who commonly did not speak the Russian language headed the universities, which were scientific idea carriers back then. Nearly all national scientific publications were called off, foreign ones were published rarely and irregularly, even simple study guides were usually translated. It is fortunate that this period was not long: the reforms of Alexander II, apart from the well-known consequences, resulted in a gradual recovery of direct connection of Russian scientists with European scientific life: as early as 1862-1863, more than 60 persons went abroad for 2-3 years "to qualify the professorial chairs in disciplines of all kinds". Regular reports of junior scientists about their stay in European Universities were published in the "Journal of Ministry of Education". Most European countries already had founded societies of naturalists and doctors at that time. Periodic meetings of the society members provided an opportunity to swap new ideas immediately, to learn firsthand about colleagues' achievements, to discuss the ways of follow-up researches jointly. The preconditions for having such meetings in Russia started forming at the very beginning of the sixties. At the end of 1860, “Moscow medical newspaper” published the message of doctor S.A. Smirnov in which he told about the 35th meeting of German naturalists and doctors. He straightforwardly pointed out that it would be a doubtless benefit for homeland medicine "if Russian doctor from one end of Russia gave a hand to a doctor from another end of the country, exchanged words, let know his needs and pursuits. In such a way a doctor could find approval, sympathy and fit of energy". Inconsiderable in number and practically separated societies of Russian doctors (there were such entities in Moscow, Saint Petersburg and Kiev) started to realize a necessity to "found a public annual congress of Russian doctors with the permission of the government". In 1861, Professor of our University F.V. Ovsyannikov told, "none of us has a doubt about a great benefit of scientific meetings in Russia; I flatter myself that, having obtained the permission, the Society of Russian Doctors in Saint Petersburg is going to lay sound foundations of the Congress". In 1862, Moscowites and Kievans, having gained the support of their governor-generals, prepared organization planning and a petition for the permission to hold the congresses of doctors and naturalists. Medical Board of the Ministry of the Interior considered these documents and positively received all the proposals: “We expect that these meetings will make an effective contribution to successful development of the above-mentioned fields of study in our homeland both from the theoretical and practical perspectives and will have a beneficial effect on health support, health care and health recovery”. The Minister of the Interior raised no objection and the Minister of Education А.V. Golovin represented an appeal to the Emperor where he expressed his favorable opinion about the congresses. Alexander II did not make a decision himself; he delegated the case to the discretion of the Council of Ministers, which dismissed a petition because of the concerns expressed by some of the Council members that "the congresses could be a cover of political objectives". Probably the idea of regular national meetings of naturalists and doctors would have been buried for years if it weren't for the energy of Karl Fedorovich Kessler, professor of Kiev University, head of Zoology Department at the Faculty of Physics and Mathematics at Saint Petersburg University since 1862 and later on - Dean of Faculty of Physics and Mathematics and the principal of Saint Petersburg University. K.F. Kessler was apparently a main mover of the failed national congress of naturalists (as far back as 1856, he worked out a project "Congress Regulations for Naturalists and Doctors"). He realized the advantages of such meetings because not only did he visit the Congress of German naturalists in Koenigsberg in 1860 but also because he learned from experience that face-to-face interaction between scientists is necessary. In 1861, with the close support of N.I. Pirogov, K.F. Kessler found a way to obtain The Minister of Education permission to hold a meeting of natural science teachers who worked in the gymnasiums of Kiev academic circuit. The success of this meeting (28 participants out of 44 represented Kiev) persuaded K.F. Kessler that he is on the right way. Overall situation in Russia was improving little by little. The New Statute of The University was approved in 1863 and became a part of this improvement. The Statute is based on the idea of the University self-government as a corporation of professors. The Council, which consisted of all the professors, became the main and relatively independent regulatory body of the University. Faculty meetings (councils) also got partial self-government: all the scientific and studying issues within the faculty were claimed its responsibility. These reforms resulted in the next successful attempt to hold the congress. At the end of 1866, a new Minister of Education Count D. Tolstoy requests K.F. Kessler to give feedback about the benefit of such a meeting. Having been fully supported by the University Council, K.F. Kessler handed over all the necessary petitions to the Ministry of Education in January 1867. This time the issue consideration by the Ministry and by the Council of Ministers did not take a long time and the Royal decree to organize the Congress was obtained on 2 May the same year. The first meeting of Saint Petersburg Society of Naturalists was held at the end of 1868. Down to our days, the Society was the University's structural subdivision and only in 1992, it was registered as an independent regional public organization, which nevertheless kept its close ties with the University. Obviously, K.F. Kessler became the first President of the Society. It is important to highlight that during all the further history of the Society it was headed by brilliant scientists and university teachers who contributed a lot to the development of science and students education. On the death of K.F. Kessler in 1881, Professor and an outstanding botanist, A.N. Breketov was appointed to the position of President. Geologist and Professor А.А. Inostrantsev superseded him in 1900. From 1920 until 1930, the Society was again chaired by a botanist I.P. Borodin, and from 1931 until 1938 - by a physiologist, academician and knyaz А.А. Uhtomskiy. In 1938, the position of the President was given to a hydrobiologist and Professor K.М. Deryugin, a zoologist Yu.I. Polyanskiy led the Society since 1939 until the start of The Great Patriotic War. V.A. Dogel was holding the position of the President for 14 years until 1955; he was a zoologist, parasitologist and a corresponding member of the USSR Academy of Sciences. S.D. Lvov, a plant physiologist and also a corresponding member of the USSR Academy of Sciences was the President from 1955 until 1957. Physiologist and academician L.А. Orbeli was in charge of the Society's activity from 1957 until 1958. A physiologist and a corresponding member of the USSR Academy of Sciences L.L. Vasiliev, who stayed in the president’s chair until 1966, replaced him. The longest presidentship of 18 years fell to Professor B.P. Tokin's share who was a Hero of Socialist Labour, Honored Scientist of the Russian SFSR, a laureate of State Prize of the USSR twice and Chairman of Embryology Department of our University. In 1985, Yu.I. Polyanskiy was chosen the president for the second time; he had become a corresponding member of the USSR Academy of Sciences by that time. Since 1991, the Society is headed by an embryologist, Professor of SPbSU A.K. Dondua, well known to the students of our faculty as the author of a remarkable two-volume book "Biology of Development". Carry out the spread of natural science knowledge in Russia. Assist Russian nature research preferentially in the region of Baltic, White and Arctic oceans. At the second half of XIX century, successful development of the Society was encouraged directly or indirectly by an advent of the University natural-science schools that were noted throughout the world. Among these there were P.L Chebyshev's math school, E.H. Lenc's physics school, D.I. Mendeleev's and А.М. Butlerov's chemistry school, А.N. Beketov's botany school, I.I. Mechnikov's and А.О. Kowalevsky's embryology school, I.М. Sechenov's physiology school, V.V. Dokuchaev's soil science school and А.А. Inostrantsev's geology school. With the other top scientists we cannot help mentioning the name of S.S. Kutorgu, who was a brilliant polymath and outstanding organizer that stood at the origins of the University Departments of Anatomy, Zoology and Physiology. Studying of Russian natural resources, flora and fauna is one of the main goals that the Society established from the very date of its foundation. As early as 1869, there was an expedition to White and Barents Sea; in 1881, the Society founded Solovetsk Biological Research Station with assistance of the largest orthodox monastery on Solovetskie Islands. It was the first station in polar latitudes. On the station opening, The Ministry of Education funded 1000 rubles for the library, chemical agents and equipment, but never offered permanent financing, so all the further researches were done at the expense of the scientists and the Society of Naturalists. Scientists not only from Saint Petersburg came to the station, but also from Moscow, Kharkov, Warsaw, Yuriyev and Kazan (V.М. Shimkevich, N.М. Knipovich, А.L. Byalynickiy-Birulya, А.K. Linko, D.D. Pedashenko, М.N. Rimskiy-Korsakov, K.P. Sent-Iler, P.Yu. Shmidt, P.K. Tarnani, S.М. Gercenshteyn, V.А. Fausek, K.I. Hvorostanskiy, I.P. Zabusov, N.L. Livanov, G.А. Klyuge and others) and students. Twenty years of their work resulted in more than 60 treatises dedicated to flora and fauna of White Sea such as the landmark researches "Invertebrates of White Sea" by N.P. Wagner (1885), “White Sea fauna attendance” by V.М. Shimkevich (1889) and “Data about fauna of Murmansk Coast and White Sea” by S.M. Gercenshteyn (1885). Unfortunately in February 1899, Holy Synod made a decision to remove the biological research station from the Solovetsky Monastery territory on insistence of the monastery executives despite all the efforts to stand up for the station made by V.M. Shimkevich, who was a Director, A.A. Inostrantsev, the President, and even the honorary chairman of the Society grand duke Alexander Mihaylovich. Solovetsk station shutdown led to transferring of the workscope to the Barents Sea, which was even more interesting from a zoological standpoint. The Station moved to the Catherine harbor in Kola Bay at the beginning of the summer of 1899. The next stage of development of the station works in the North started two kilometers from the town Aleksandrovsk (nowadays Polyarny). Murmansk Biological Research Station of Saint Petersburg Society of Naturalists was founded there and finally developed into Murmansk Marine Biological Institute of RAS Kola Bay Branch. The research of Russian natural recourses was not limited to the North region. In the 1970s, the Society of Naturalists organized long-continued geological, botanical and zoological study of the Ponto-Caspian-Aral Sea region and all the steppes located between these seas. The results of the attendance were published in the eight issues of the journal "Caspian-Aral Expedition Treatises" from 1875 until 1915; the ichthyological research was summarized in the comprehensive work by K.F. Kessler "Description of fish families that inhabit both the Black and Caspian Sea". While researching the fauna of the Baltic Sea in 1875, О.А. Grimm suggested a hypothesis that this body of water is a result of Scandinavian gletcher ice melting and so rejected common beliefs that the Baltic and White Sea used to be conjoined. The researches of V.V. Dokuchaev, one of the soil science founders, had a great share in soil analysis progress in Russia. He was the first to define soil as a specific historical and natural feature that arose out of vegetation and rock interaction. By drawing botanists into the soil analysis V.V. Dokuchaev laid the foundations for elaboration of a wide range of geobotanical issues. There were two permanent committees of the Society: the Crimea committee founded to research Taurida's nature and history in 1883, and Nevsky committee organized for a detailed survey of flora and fauna in Saint Petersburg precincts in 1890. Obviously, the 140-year history of Saint Petersburg Society of Naturalists did not use to have only prosperity phases. The wars, years of devastation and time of the country revival, dramatic socio-political reforms of the ХХ century had to result in hard times of the Society, but the key point is that it continued working without a break at any time. Even during The Civil War and all the following difficult years when the Society either lost the state funding or got negligible sums of money, it never stopped its activity thanks to membership fees, free-will donations (for example, the Institute of Physiology under our University transferred 1100 rubles to the budget of the Society in 1934), proceeds from the sale of published "Treatises of Society of Naturalists". A great zoologist V.A. Dogel (who afterwards became a corresponding member of the USSR Academy of Sciences and Lenin prizewinner) headed the Society during The Great Patriotic War, evacuation period and since the autumn of 1944 when the University came back to Leningrad. From the memories of Dogel's disciple, prof. T.A. 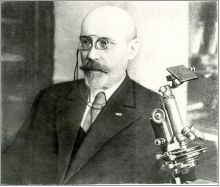 Ginetsinskaya, all his scientific activities were inseparably associated with the Society, which he joined right after the university graduation in 1904. The Society Meetings were reinstated in room 143 of Department of Invertebrate Zoology in the main building of the University in the cold winter of 1944-1945. Dialog-starved people actively visited the meetings, the defining attribute of the time was permanent presence of the students at the meetings. The room was practically not heated, nobody got undressed, V.A. Dogel, a chairman of the meetings, rose above everybody in a coat of a heavy black cloth lined with fox fur, wearing fur hat and felt boots. Nowadays The Society of Naturalists experiences a period of upsurge. Stated 140 years ago directions of activity have stayed the same ever since. One of traditional forms of activity is dialog assistance programs for biologists of all types, ecologists, geologists, mineralogists etc. also, public plenary meetings as a rule held in one of the classrooms of Faculty of Biology and Soil. Not only do researches from our country make reports at these meetings but also invited from abroad professionals. Another high-priority line of action of the Society is still complex research of nature in the Northwest Region of Russia as it was in the days of K.F. Kessler. The Society supports student expeditions to Leningrad region since 1989. For a good while Kurgalsk and Valaam expeditions, which were formed mainly from the students of our University, worked under the guidance of the Society. At the present day research and development center "Valaam" has been founded on the basis of Valaam hydrometeostation in cooperation with Hydrometeorological Service of Russia. A large-scale environmental research has been started when the Baltic Green Fund was formed as a part of The Society in 1995. The fund managed to become a center, which attracts financial resources of international environmental organizations, and now it coordinates the activity of several field parties in Karelia, Saint Petersburg, Pskov and Novgorod region. Saint Petersburg Society of Naturalists became a member of the International Union for Conservation of Nature and Natural Resources (IUCN) in 2000. Results of the Society members’ research are published in six volumes of "Treatises of Saint Petersburg Society of Naturalists" dedicated to various sections of natural science. The Society has resumed annual Best Publication Awards in the field of natural science (monographs and topical series of articles) since 1993. Once in three years the Society hosts Best Textbook and Study Guide Awards. The Society has a special focus on the assistance of junior researches. Since 1990 Master's and Graduation Theses Competition is held in our University annually, where students of Faculty of Geology, Biology and Soil can obtain a scholarship on a competitive basis. In 1999, The Baltic Green Fund established scholarships for biology students whose work is associated with nature conservation research. As early as the beginning of the ХХ century, the Society founded the International Kowalevsky Awards in tribute to a great Russian scholar, one of the founders of evolutionary embryology, a graduate and later a Professor of Saint Petersburg University A.O. Kowalevsky. The award consisted of a medal and money amount equal to 250 rubles. The face side of the medal portrayed A.O. Kowalevsky; the other side had an image of seabed with various invertebrates, Kowalevsky's objects of research. The medal was awarded for research in comparative anatomy and embryology of animals. Nobody got the chance to win the award before The First World War and then it sank into oblivion until the end of the ХХ century when the single copy manufactured at the St. Petersburg Mint was found in the numismatic collection of the State Hermitage. Fortunately, the Mint Museum still had the moulds for plaque casting and the medal was restored by efforts of the Mint. In March 2001, the SPbSN Academic Council reinstated the international award of the Society in commemoration of the 100th anniversary of A. O. Kowalevsky's death and nowadays the medal has been regularly awarded for distinguished achievements in comparative zoology and embryology to researchers who made significant contribution to modern ideas on phylogeny of animals and developmental biology. The award procedure stipulated a large international nomination. International Committee was elected to hold the nomination, which consisted of well-known American, German, Spanish, Danish, Canadian and Russian scientists. In 2001 Kowalevsky medal was awarded to Australian D. T. Anderson, the world-recognized authority in comparative anatomy and embryology; K. Sander, Honorary Professor of Freiburg University, known for his brilliant works in descriptive and experimental embryology of insects; O.M. Ivanova-Kazas, Professor of our University, a distinguished representative of the St. Petersburg embryological school, the author of well-known monographs and manuals on comparative and developmental embryology; Dane K. Nielsen, who made an inestimable contribution to the development of comparative morphology and phylogeny of multi-celled organisms; R. Riedl, Honorary Professor of Vienna University, known not only for his research in marine zoology, but for his great contribution to the theoretical development of comparative morphology; American R. Raff, the author of several books on embryology and evolution, fruitfully combining modern molecular biology approaches with comparative anatomy and phylogeny; one more American G. Freeman, a recognized leader in research of embryological grounds of animal evolution; Canadian B. Hall, who made a great contribution to the modern synthesis of embryology and evolution. Since 2002, only one medal is awarded annually. Eric Davidson, Professor of California Institute of Technology and member of the United States National Academy of Sciences got the highest rating and was awarded the medal in 2002. Eric Davidson is one of the most outstanding modern molecular biologists successfully working in developmental genetics. He is the author of an ingenious theory on the origin of bilateral animals. The theory is based on recognition of the leading role of the evolution of genome regulatory systems. In 2003, according to the recommendation of the International Committee, the Kowalevsky Medal was awarded to Walter Gehring, Switzerland Professor and distinguished molecular developmental biologist, whose works on genetic systems that control embryonic development showed that invertebrates and vertebrates have identical control systems. 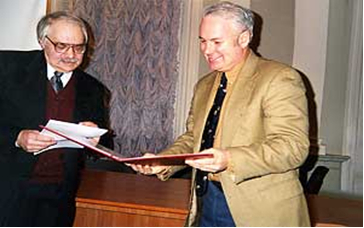 In 2004, the Alexander Kowalevsky Medal was awarded to S. Gilbert (USA), Professor of Swarthmore College, Honorary Member of SPbSN. Scott Gilbert is known in the worldwide scientific community for his deep theoretical research in evolutionary and ecological developmental biology. His "Developmental Biology", the world-famous textbook that ran into eight editions is a true encyclopedia of modern embryology, which was translated into Russian some years ago. His brilliant speech on ecological embryology problems, which was given in the Petrovsky Hall of SPbU, impressed everybody very much. It should be mentioned that the scientific community warmly welcomed the reinstatement of the Alexander Kowalevsky Medal, the international award of the St. Petersburg Society of Naturalists. In January 2003, Alexander Kowalevsky Medal Winner Symposium was held with great success in Toronto as a part of the annual Congress of the Society for Integrative and Comparative Biology. In conclusion, let us review once more the 50-60s of the XIX century. The idea of a convention belonged to the naturalists and doctors. Somehow, the First Congress only got together the naturalists. What is the reason for that? - That is a separate topic. One of the reasons, probably, was permanent lack of medical service professionals in Russia in the XIX century, this situation made universities and the Academy graduate doctors at a growing rate and scale back the fundamental courses in educational program for doctors; understandably, "speed-up" of training was carried out at the expense of natural sciences. So what were they going to discuss at the meetings? The ХХ century only reinforced the tendency (ex., refer to the article by А.V. Balahonov and V.V. Nezgovorova). Let us remember, however, the thoughts of S.P. Botkin who expressed his beliefs about the requirements applicable to a doctor, “...a doctor should be a surgeon or a therapist to the same extent as a naturalist, because rational medicine is inconceivable without knowledge of natural science, particularly hygieology which is the most important part of medicine for a soldier”. These words were actually his conclusions that training of medical professionals needed fundamentalization (he talked about military doctors, but it does not change the main point). Isn't it the very time to go back to a closer "collaboration of naturalists and doctors"? The first step in this direction could be a startup of a medicine section of Saint Petersburg Society of Naturalists, which would the first one in all of 140 years of its proud history. Training principles, established on the foundation of SPbU Faculty of Medicine, consider the modern tendencies of medicine development and the necessity of fundamentalization of higher medical education, based on systematic knowledge of natural science, and perfectly correspond with the ideas proclaimed almost one and half century ago by the first President of the Society of Naturalists K.F. Kessler, "promote Russian land welfare, which is a goal that we should dedicate all our initiatives and effort ". Main view of Solovetsk Biological Station, 1897 (archives of Dept. of Invertebrate Zoology, SPbSU). 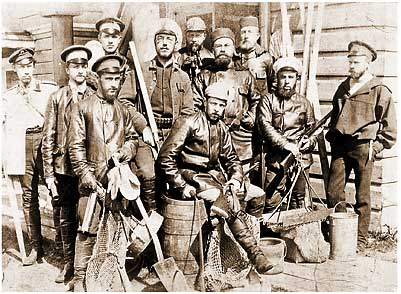 Solovki Expeditionists (the sixth person from the left - V.М. Shimkevich), 1893 (archives of S.I. Fokin). 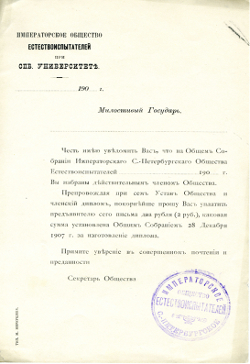 Notification of admission to Saint Petersburg Imperial Society of Naturalists, the first part of the ХХ century.